June 27, 2015 Martial Arts, Muay Thai, Personal Development, SportsCombat SportsThe Little fighter still has a big heart. This week as always has been good. It’s been tiring but good. I trained for the last time Monday morning and evening at Sitsongpeenong and flew home that evening. Nearly a day later I arrived back at my flat and that was all she wrote. Despite jet lag and post holiday blues I headed out to the gym on Wednesday night for a decent nights training after a short run in the day and decided to follow suit the rest of the week. Wednesday and Thursday were graft as I was still fighting off jet lag ( I have been most of the week) and waking up at 6.20 am wasn’t helping things either. Despite wanting to slow down a little I decided to train Friday night and was pleased to find myself a lot more relaxed and sharper than I thought I would be. I finished the week off this week with a good bit of sparring and clinching this morning, and have just done a 6 k run that very nearly sapped the last of my life force. I’m pleased I did it and ok, it’s nice to be home. 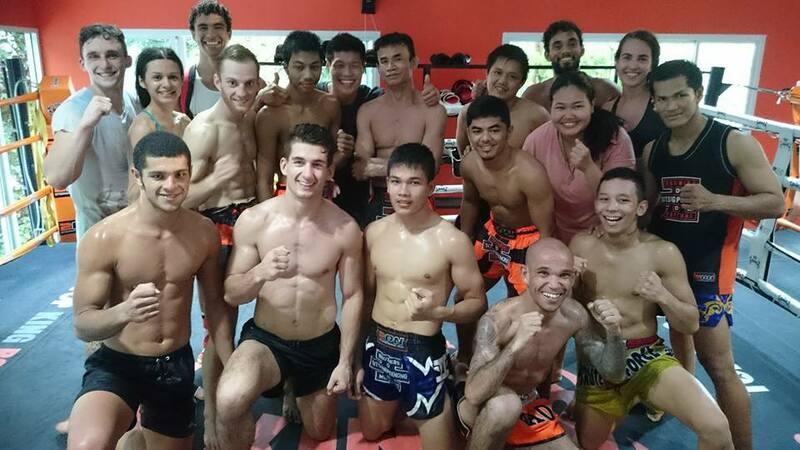 Training always pays off, and I’m glad I made the effort to head out to Thailand again. Being honest, I’ve already started looking at my next trip out there and from my point of view if your going to invest in anything it may as well be in something that you love doing. Although training at home is very different from Thailand I’m as always enjoying it and in the future if one of my gyms has a weekend when you can train morning and afternoon I’ll be a happy boy. Training twice a day is the way forward. I guess if you do that all the time you can’t help but get good. I’m pleased to find some of my technique has improved, frustrated to find that my body kicks still need a lot of work (being honest I sort of knew this was going to be the case but you know..), but pleased that I’m twisting a bit more and that my left kick is strong and a little higher. I’m pleased I’m relaxing more in myself, last night when I was sparring I was throwing shots, stepping off a little and keeping up a good work rate so I surprised myself. My guard is better too and that left kick I moaned about a minute ago? well I can deliver it well when I relax and let it go. I have a long way to go and I’m enjoying the process. I guess the journey is ongoing and the destination is never final. When it comes to fighting there’s more on the cards this year and I’m pleased that I’m keeping the momentum up with training. I’m determined to keep practising what I was shown and to remember some of the advice I was given as I can see it serving me well in the future. I had a brief conversation with one of the fighters training at Sitsongpeenong when I was there called Tae. He asked me if I have had many fights and I said a little sheepishly that I have had 14 fights but not at a ‘pro’ level. Grinning he told me that really it’s all the same. He said that ultimately a fight is a fight. The difference between an ‘amateur’ and a ‘pro’ is that a pro trains twice a day to keep themselves at a good level and has a good level of experience too. Other than that its still the same. It still takes the same amount of courage and the same amount of heart. The skill develops the more you train and commit to what you do. I guess when your in that ring who you really are shines through anyway. It’s great to train with people at a very good standard as you can learn a lot and despite having a hard time clinching and sparring on more than one occasion, I still feel that it was more than worth my time and I can see me getting better and better as Iong as I put in the work and always strive to be in those uncomfortable places we all grow to love. So next week and the week after that it’s back to the gym as usual. I’ve trained pretty hard this week and I intend to keep the momentum up. You can’t beat tenacious and hungry.Even if it does get beaten it only ever comes back stronger. So in the meantime, have a good week, train hard and have a good journey. I’ll see you on the road.